If changing the world for the better was easy, we’d all do it. But it isn’t. It’s incredibly hard. But thinking that you can make a difference is audacious. It takes a sort of beneficent arrogance to set out to push humanity in a positive direction. To believe you will succeed is madness, but to believe otherwise is to surrender. I think of giving up as a form of death, so I’ll gladly side with the crazy ones who are trying to make things better. The world needs change as we’re headed toward multiple planetary boundaries, so someone needs to take the wheel and point us in a better direction. I was invited to an intriguing event last Friday where I learned about the plans for something audacious. Something crazy. As you may have guessed by now, the Pilgreens are going on a trip, and it’s no ordinary one. 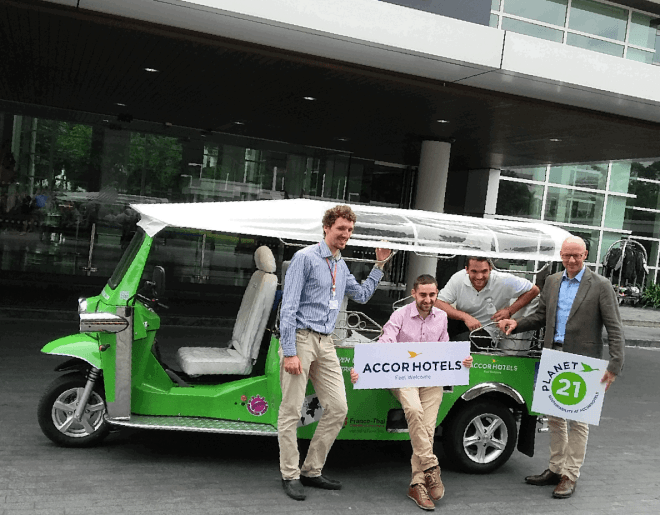 They’re going to take an open-air, electric tuktuk on a journey from the College of Management Mahidol University (CMMU) in Bangkok, Thailand, (where Karen and Ludwig just finished their final year of graduate school), to the university in Toulouse, France, where the three friends met. Did I mention that this is crazy? I was fortunate enough to sit down for lunch with the Pilgreens at the Pullman Bangkok Hotel for the project launch event last Friday (Accor Hotels is the project’s primary sponsor). They seemed to be easy-going, fun-loving guys. Had I met them under different circumstances, I would not have imagined they were setting forth on such an incredible trip. But they’re driven by something meaningful – a desire to make a real difference in the world. The vision guiding their trip is “to be a global driver of electric mobility through the promotion of sustainable projects in developing countries.” Connecting that with the act they’re getting ready to undertake may come across as madness, but it’s not thoughtless madness. It’s the kind of thing which just might make a difference. The Pilgreens may have started with the outlandish idea of “What if we drove an electric tuktuk to France?” But they’ve followed up on that idea by bringing the project to fruition, as well as putting together an integrated plan for connecting with an audience and getting that audience to engage with the project. And completing “Mission TukTuk” is not the end goal. It’s meant to be the ignition of a movement. Along with issuing weekly calls for “green actions” by those following their exploits, the Pilgreens’ trip will leave a legacy in the form of a documentary, as well as the NGO which they’re starting. I’m excited about following their journey, and so I’ve chipped a few dollars in on their Kickstarter project (they still have a bit of equipment to buy for the documentary), and I hope you’ll consider joining me in doing so. I wrote the intro to this before having a thorough look at the Pilgreens’ website. I found that the bottom of the page paraphrases an old Billy Joel song, “You may think ‘They are crazy,' and you may be right.” I’ll finish the line by adding: but it just may be three lunatics we’re looking for! Here’s wishing good luck and godspeed to the Pilgreens. Let’s hope they find us a route to a more sustainable world.